Flight 794 departed Houston with a an inoperative no. 1 thrust reverser. On August 20, 2002, the number one thrust reverser had been deactivated by maintenance personnel. The airplane touched down at Phoenix on the centerline of runway 08 about 1,200 feet beyond its threshold. During rollout the captain positioned both thrust levers into reverse but then took the number one thrust lever out of the reverse position and inadvertently moved it to the Take-Off/Go-Around (TOGA) position, while leaving the #2 thrust lever in the full reverse position. Full left rudder and full left brake application did not compensate for the yaw. The airplane continued swerving to the right until exiting the right side of the runway. It crossed the apron east of intersection B8, and experienced the collapse and partial separation of its nose gear strut assembly upon traversing the dirt infield area south of the runway between intersections B9 and B10. PROBABLE CAUSE: "The captain's failure to maintain directional control and his inadvertent application of asymmetrical engine thrust while attempting to move the #1 thrust lever out of reverse. 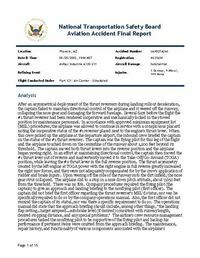 A factor in the accident was the crew's inadequate coordination and crew resource management." Distance from Houston-George Bush Intercontinental Airport, TX to Phoenix-Sky Harbor International Airport, AZ as the crow flies is 1611 km (1007 miles).